I am so close to the end that it is scary. Only two drawers left after this one. My Apothecary Chest has seven rows of seven drawers, each 16” deep. Across the bottom, there are only three drawers: I call them my “double-wides.” And, I guess, because they are odd-sized, I used them for odd beads which didn’t have a home in one of the other 49 drawers. So these last three are free-form! The first is wood. I found enough to fill one-third of a drawer. Not the sophisticated wood of Drawer 4; but playful wood, reminiscent of the large shapes that were strung into necklaces for us as kids—at least in my house where we were five girls, only eight years from me to my baby sister, and a play producer Mother—dress-up and staging plays in the cellar was what we did if there was no sun shining outside. I glossed over the playful beads as I tumbled them onto my work surface because I immediately saw a contemporary (dare I say sophisticated?) design in black and beige. It is pictured above; I shall let you judge. The necklace is symmetrical, chunky, and very light. A pleasing yet somewhat bold design. 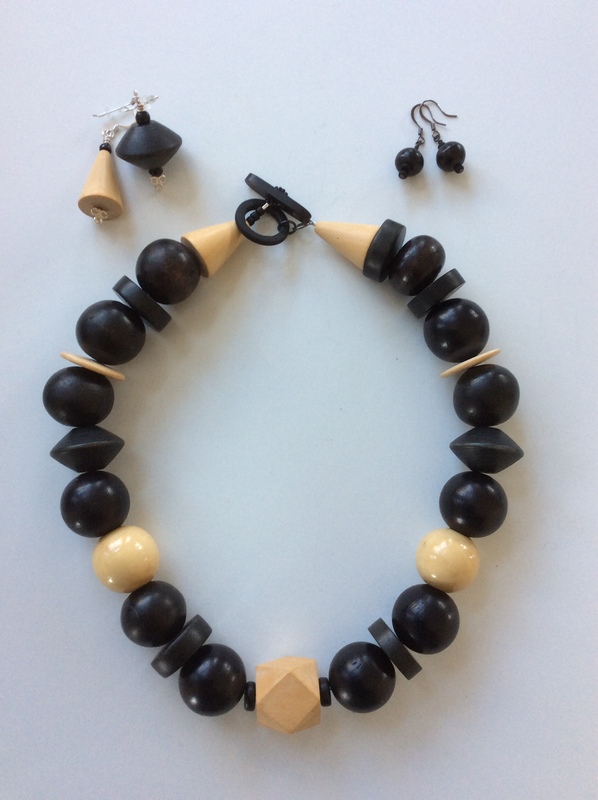 But I didn’t restrain myself with the earrings: asymmetrical; one beige, one black, neither matching. I got cold feet the next day and made a conservative pair of earrings. Both come with the necklace. Wearer’s choice. The necklace measures 21.5” and is $59 including two pair of earrings. I’ve been asked. Yes, Virginia, there will be a next year. I’ll take a break from weekly challenges and make it monthly in 2018, with little bits popping up in between on some Wednesdays. More info soon. It’s premature, but THANKS, I couldn’t have done this without your feedback and that ultimate compliment of a purchase. Playful for sure. Sophisticated, ummmm. Perhaps a bit retro and whimsical at the same time. Anxiously awaiting the final two!! Finish line in sight. Great chunky look! Like the earring variety as well! This reminds me of you, Priscilla! Light, fun with a splash of sophistication! Hope your holiday season is going well!